This is an edited verion of an article that appears in the current issue of Tin House. Once a week, as I was growing up in the north of England, I watched my Irish grandfather eat a boiled pig’s trotter. I watched with fascination rather than envy, since my parents had assured me, with the certainty parents so often have, that I wouldn’t enjoy the taste of a pig’s trotter. Later in my life I learned this wasn’t true, but at the time I didn’t argue. There were, for sure, other, much bigger battles to be fought against my parents, but when I look back on it I wonder quite why they were so insistent that pigs’ trotters weren’t for me, and I think the answer is because they’d decided pig’s trotters weren’t for them. My parents were making a long, arduous journey from the working class to the middle class, and instinctively they’d decided that eating pig’s trotters would slow their social ascendancy. 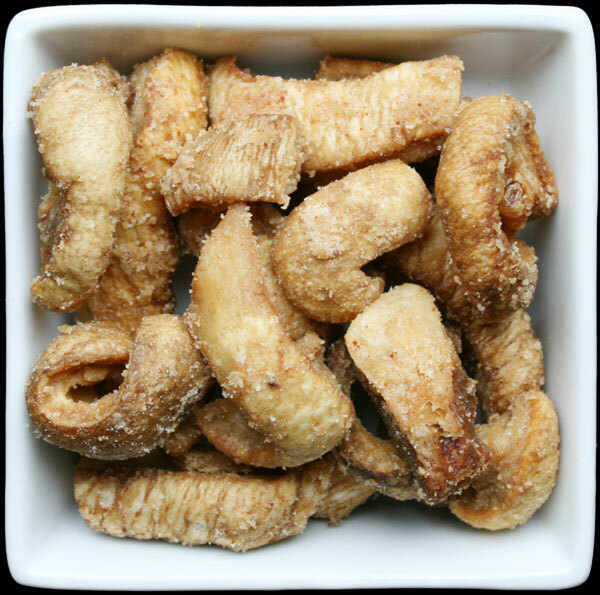 Trotters were peasant food, and my parents were no longer prepared to be peasants. Today I live in Los Angeles, not entirely a bastion of social egalitarianism, though certainly a place where an Englishman can kick over the traces of his origins if he wants to, at least until he meets another Englishman. 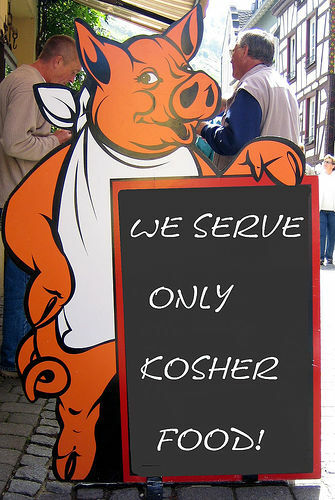 It’s also a place where it’s currently hard to find an upscale restaurant that doesn’t serve pigs’ trotters. Peasant food is now very hip indeed. Mario Batali’s Osteria Mozza serves trotters with cicoria and mustard: at Thomas Keller’s Bouchon they come with sauce gribiche. 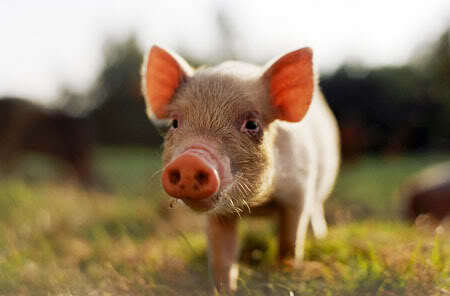 At Animal you’re likely to find not only trotters, but also pig’s ears, cheeks and tails. These would have been even more unthinkable to my parents, though they were perfectly happy to eat any number of other “low” pork products: pork pies, black pudding, “scraps” which were a type of deep fried pork skin, and also pork “dripping”: this was regarded as a wholesome bedtime snack. Pork roasts themselves, of course, were regarded as rather superior fare, and bacon was eaten at every available opportunity. I was born and grew up in Sheffield, specifically in the rough but striving, working class neighborhood of Hillsborough. 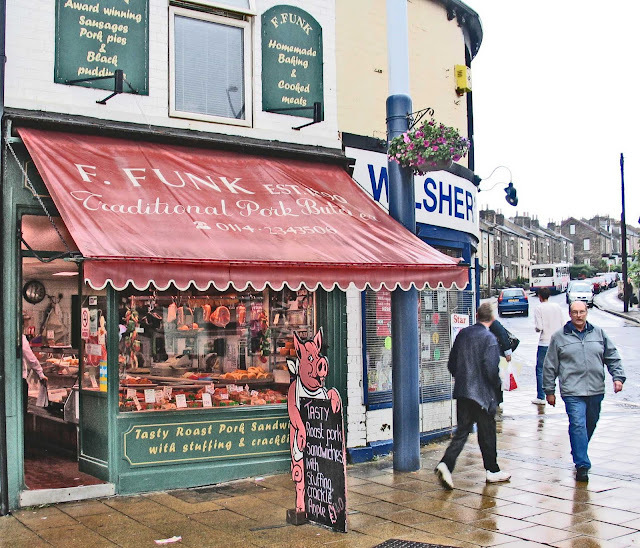 At the time it seemed all too unremarkable, but looking back on it, two things stand out: that it had a large Catholic population (which included the majority of my own family), and that there were more pork butchers and “pork shops” than you’d think such a small suburb could possibly support. A Sheffield pork shop was, and still is, a place where you buy hot pork sandwiches complete with crackling, apple sauce and stuffing. Los Angeles doesn’t have an exact equivalent as far as I’m aware, but having a large Latino population means there’s no shortage of places to buy and eat pork in myriad forms. 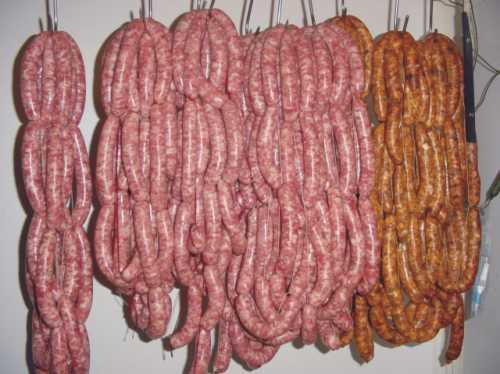 Chorizos, longanizas, morangas, chicharróns, cuertos, quesos del puerco: we got ‘em. And one day as I was wandering around Macarthur Park, at rough but striving, working class neighborhood toward downtown, admiring the carnecerias, the taquerias and the stores that sold plaster statues of Jesus and the Virgin Mary, it struck me that this area had a lot in common with the place I grew up. More than that, I began to suspect there must be some strange, deep connection between pork, class and Catholicism. Why, I wondered, do Catholics seem to like pork so much? Apparently I’m not the first to have asked this question. An online resource called the Catholic Answers Forum tells me that god revealed to the apostles that the dietary laws of the Old Testament did not apply to Christians. It’s there in Acts 10: 9-16, where Peter is told that if god made an animal then by definition it can’t be unclean, and is therefore OK to eat, which I think has a nice logic to it. And again, in Colossians 2: 16-17 Paul says, “Let no man therefore judge you in meat, or in drink.” In other words, just because the Jews don’t eat bacon, that’s no reason for you not to eat bacon. 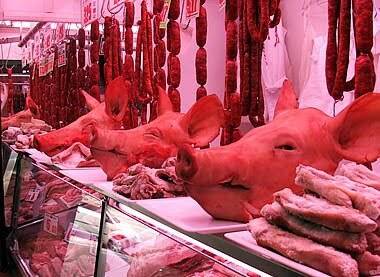 Of course you don’t have to be Catholic to love pork, any more than you need to be Latino or Irish, but coming from a working class culture that tries to stretch its money, and its food, to the limit seems to be a large part of the equation. And in rural society, it’s possible to imagine a poor family owning a pig, keeping it in their back yard and feeding it on household scraps and leftovers. Owning cows and sheep, even a goat, is a trickier proposition, requiring at the very least access to grazing land. My own front garden contains a shady area, under an oak tree, where a pig could live very happily indeed, but frankly I think the chances of my successfully getting through L.A.’s zoning variance process are close to zero. It remains a warm, recurring fantasy however. There’s a widespread belief in LA that some of the city’s best food is to be found not in five star, white table cloth establishments, but in hole in the wall joints located in mini-malls, places that favor Formica tables, fluorescent lighting and gruff non-English speaking waiters. Certainly there are moments in Los Angeles, when you find yourself in some grittily cheerful cantina alongside working stiffs, off duty security guards, groups of secretaries having a night out, guys who’d like you to think they’re gang members, and you’re all there together devouring carnitas, puerco asado or burrito Jalisco (and yes OK, there may be a few lightweights who aren’t eating pork) and you think to yourself, yes this is democracy and equality in action. Such classlessness is of course a one way street. As yet the security guards and would-be gangbangers aren’t regulars at the Ivy and Spago. Somehow this all ties in with the current food trend sometimes called (not by me) the “nouveau truck scene.” Street food surely ought to be the most classless food of all, and once this was very straightforward. There’d be a taco truck parked outside your office building at lunchtime or outside a club after a gig and you’d buy a pretty good, grease bomb of a burrito, swallow it down and damn the cholesterol. If some of these trucks weren’t strictly legal, and were sometimes hassled by the cops, well that was all part of the fun. But now the scene has mutated, and some would say got too fancy for its own good. Alerted by Twitter, hipster foodies now drive all over town chasing down the latest truck selling Guatamalan/Korean fusion tostadas (or whatever). At the same time, cutting edge restaurants, that have never had the slightest connection with the street, now operate their own trucks to make themselves appear authentic. If you think this is less like egalitarianism than highly self-conscious slumming, you’ll get no argument from me. 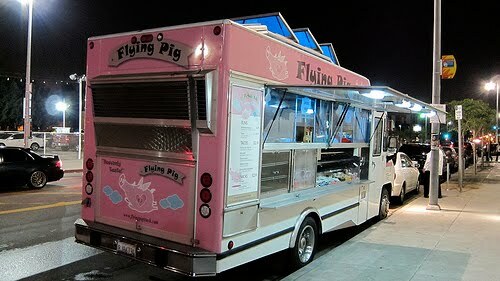 Although I admit it’s hard to resist a food truck called the Flying Pig. 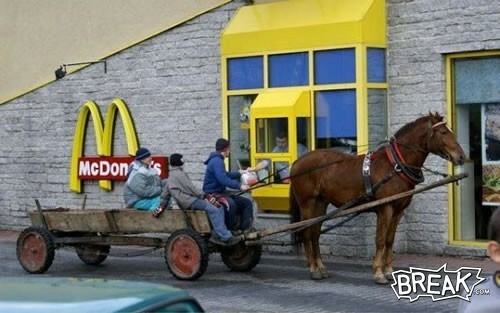 In fact, much as I hate to say it, there are times when mainstream fast food chains seem far more genuinely classless. You see the line of vehicles waiting at the drive thru window of a McDonald’s or a Taco Bell or a KFC, and there’ll be a dented old pickup truck waiting behind a minivan full of a mom and her kids, waiting behind some movie guy in his Porsche, and you think, yes this a version of the American dream; all classes and types sharing the same appetites, buying the same products, eating the same food. And if the food is uninspired and generic, constructed to satisfy the lowest, least interesting tastes, well, maybe that’s the price you have to pay for democracy. Not much point going up to people in the line and telling them they should eat pig’s trotters. No point whatsoever telling them they should eat more like peasants. Your mention of McArthur Park reminds me of a family story. I grew up in LA a long time ago. It was still called Westlake Park in 1946. The day my brother was born, my cousin and I were taken there for a special treat, a canoe ride on the lake, and getting out of the canoe, she slipped and fell in the water. (She was just 7, I was 8) The neighborhood wasn't in the least "ethic"then.